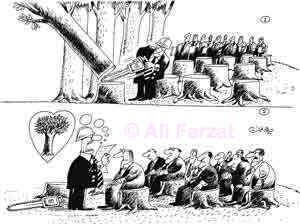 Farzat's cartoons are often dense expressions of the contradictions and hypocrisies of contemporary life. Beirut39-winning novelist Samar Yazbek was detained and beaten. Syrian songwriter Ibrahim al-Qashoush, author of a popular anti-regime song, was murdered, his vocal cords apparently ripped from his throat. And this Thursday, political cartoonist Ali Farzat, Damascus’s “Pen of Steel,” has had his head, arms, and hands severely beaten. Yes of course I am because my drawings are not anchored to a certain place and time, although they spring from local concerns and pains. But they are part of a comprehensive human art that touches the feelings of people all over the world. The works of the artist Mr. Charlie Chaplin are a clear example of what I mean. In both the interview with Davis and another with Sabah Hawasli, the specter of Palestinian cartoonist Naji al-Ali’s assassination was raised. Certainly, Farzat was aware of the danger. You can buy a collection of his work from Cune Press. And much more at Farzat’s official website. Today’s “Cartoon Movement”cartoon is in support of Farzat. A number of Syrian authors and artists have signed a statement condemning the attack. Samar Yazbek is among them. The statement can be found here. Next When is it OK for the Translator to ‘Improve’ an Author’s Text?